On the Great Plains of The United States, hidden away on the little traveled back roads of South Dakota, is American Prisoner of War Camp Number 344. It is now known as the Pine Ridge Indian Reservation, and is the home of the Oglala Lakota. Pine Ridge is ground zero for native issues because of both the work of the American Indian Movement and because of the infamous Wounded Knee Massacre of 1890, where the US 7th Cavalry killed 300 Sioux and ended the Indian Wars. Pine Ridge has been one of the poorest places in America for decades with an unemployment rate upwards of %90 and a male life expectancy of 48. Through the 1850s and 60s the US made and then broke several treaties to build trails and train lines through Lakota territory, leading to the Lakota War, in which 3 tribes, lead by the Lakota War Chief Red Cloud thoroughly defeated the US Army. In 1868 their victories won them the Fort Laramie Treaty guaranteeing the sovereignty of the Sioux Nation and the Lakota ownership of the sacred Black Hills. In 1980 the longest running court case in history, the United States vs. The Sioux Nation, was ruled upon by the U.S. Supreme Court. The court determined that when the Sioux were resettled onto reservations and 7 million acres of their land were opened up to prospectors and homesteaders, the terms of the 1868 Treaty had been violated, and that the Black Hills were illegally taken. As payment the court awarded $106 million. The Sioux refused the money, and the battle continues to this day. Statistics about the native population today, more than a century after the massacre at Wounded Knee, reveal the legacy of colonization, forced migration, and treaty violations. But today on the Reservation there are also newly formed resistance movements and a revival of the traditional spiritual ways. The sundance has come back after nearly disappearing and the people are teaching language, horse skills, and ceremonies to the youth. There is a light in the darkness. 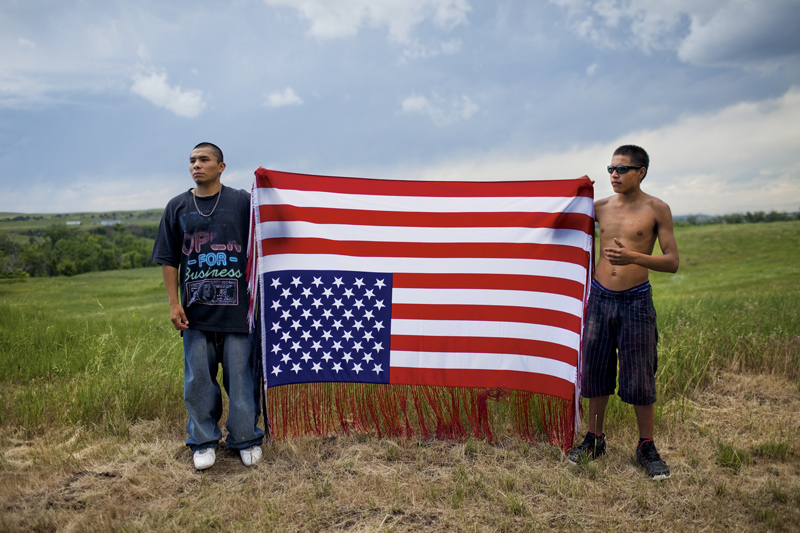 Oglala youths hold an upside-down flag, an international symbol of distress and an act of defiance toward the U.S. government, at a rally to commemorate a 1975 shoot-out between American Indian Movement (AIM) activists and FBI agents. Two agents and one AIM member died; AIM's Leonard Peltier was jailed for life.